* SPOILER WARNING FOR THE MORTAL INSTRUMENTS AND THE INFERNAL DEVICES! This post contains spoilers for BOTH series, so if you're not caught up on all of the books in the two series, you may want to quit reading this post here. It's release day for City of Heavenly Fire, the last book in Cassandra Clare's The Mortal Instruments series! Even though Ally and I are both more partial to Clare's Victorian Shadowhunter series, The Infernal Devices, we still feel a certain attachment to TMI. It was one of the first YA series that the two of us discussed enthusiastically, and we love its NYC setting. We wanted to do some kind of post for the TMI finale, so we decided to put together a list of things we'd like to see happen in CoHF. We quickly discovered that we couldn't do that without constantly referring to TID, hence the spoiler warning for both series. (We are also still in denial about TID being over and can't just let it go.) So, here's once more chance to avoid spoilers! In The Infernal Devices, the best relationship is between Will Herondale and Jem Carstairs. They are the true epitome of parabatai—they're closer than brothers and would literally die for/without each other. The bond and connection they share is definitely inspiring. In The Mortal Instruments, Jace and Alec are parabatai. Will and Jem easily put their Shadowhunter descendants to shame. Jace and Alec's parabatai bond pales in comparison to Will and Jem's bond. Yeah, Jace and Alec are buddies and everything, but I wouldn't say that they're any closer than brothers. I'm sure they would die for each other, but they wouldn't die without the other. Jace would be able to survive without Alec, but Will wouldn't be able to survive without Jem (hence the whole Silent Brother ordeal). I seriously doubt the parabatai bond Jace and Alec share. Looking at what Will and Jem had just makes Jace and Alec all the more disappointing. Will and Jem just need to travel to the future and show them how the whole parabatai thing is really done. The ending of City of Lost Souls left Malec fans, including myself, heartbroken and destroyed. One of the cutest couples in the whole Shadowhunter world broke up. Malec went back to just being Magnus and Alec. It was terrible; I could barely cope. I just about cried while reading the break-up scene. After the initial heartbreak, I went into denial. There is no way, in heaven or hell, that Magnus and Alec are going to remain split. I take comfort in the fact that this isn't the end to their relationship. It just can't be. They love each other too much. Magnus and Alec will be back together before the end of City of Heavenly Fire, just you wait. And I'm sure their reunion scene will make the break-up worth it! Thanks to the beautiful epilogue in Clockwork Princess, we all know that Jem finds a cure and is released from his Silent Brother vows. Yay! We know that this happens but we don't know the how. I'm just going to assume that our pals from TMI help Zach turn back into our precious little Jem. Jem turns into Brother Zachariah in Clockwork and is still a Silent Brother in City of Lost Souls. Some time between those two books, Jem is cured. This all means something greater—Jem is going to have a lot of book time in Heavenly Fire! I'm so looking forward to that. I'm also looking forward to Jem telling all the modern Shadowhunters about all his bad-arse adventures from back in the day! Hopefully Tessa and Will can make an appearance, too. Ally just gave me the best segue ever there! Tessa and Jem are pretty much guaranteed to turn up in CoHF, which of course makes me happy. Something I'm really looking forward to in this final installment of TMI is how it ties into TID. And if we're going to come full circle, I think somehow working Will into CoHF would only be fitting. I'm not sure how this would be possible in the way that Tessa and Jem are able to be present in the modern Shadowhunter chronicles, but I can still dream about Will being a part of CoHF, can't I? How about a flashback? Clockwork Princess featured a family tree that illustrated the lineage of the TID characters down to their TMI descendants. If I could put myself in the shoes of the Victorian Shadowhunters and impart advice to the future generation, it'd go something like this. Charlotte Branwell (née Fairchild) could counsel both Jocelyn and Clary on how to be a strong leader. The latter two have annoyed me at various times throughout TMI, and I feel that they could benefit from taking a few pages from Charlotte's book. As for Jace, I doubt that the the mopiness that has drained a lot of the life from the character I fell in love with in City of Bones would meet the approval of William Herondale. I dream of a scenario in which Will manages to make contact with Jace and tells him to snap out of it and get his crap together, phrased in Will's unique style of insult-wrapped-in-Victorian-politeness, of course. I think Simon and Isabelle make a cute couple. I was so glad that he quit pining for Clary, because that was a lost cause the moment Clary met Jace. I like how adorkable Simon complements spitfire Izzy, and those two deserve a nice little happily ever after. Or I will be terribly, terribly upset. Are you looking forward to anything in particular in City of Heavenly Fire? TID is incredible, and I highly recommend it! If you love Jace, then you'll probably love Will, too! Oh gosh, I've forgotten the details. i only have one wish and that is for MI to have an epic ending as ID. Yes! At 700+ pages, CoHF had better have an epic ending, lol. Rereading TMI has made me realize how much I've forgotten, too. I first read it about three years ago, and it seems like three centuries! I haven't read The Infernal Devices yet, but I have all intentions to. I am really looking forward to CoHF. I hope all the things that you both mentioned do in fact happen. I am ready for Malec to get back together and Jace to get out of his funk. Simon and Isabelle make the cutest couple so also very much hoping for an HEA for them. It's too bad I'll have to wait at least 2 months to read it due to my commitments :( Jaclyn @ JC's Book Haven. 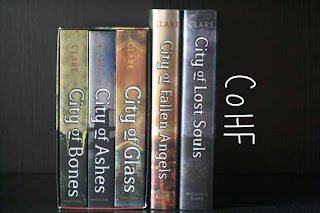 I won't be cracking open my copy of CoHF any time soon, either! My TMI reread is progressing very slowly; I've only just begun City of Glass and still have to get to City of Fallen Angels. Thank goodness I decided to skip City of Lost Souls, since it's still pretty fresh in my mind. In the meantime, I've been working very hard to avoid accidentally reading CoHF spoilers!